For information, Dave Weinstein, davidsweinstein@yahoo.com. Our annual meeting starts at 2 p.m. and lasts about 20 minutes. This not-to-be-missed event is free. Refreshments will be served. Spearheaded by El Cerrito Trail Trekkers and the city’s Environmental Quality Committee. 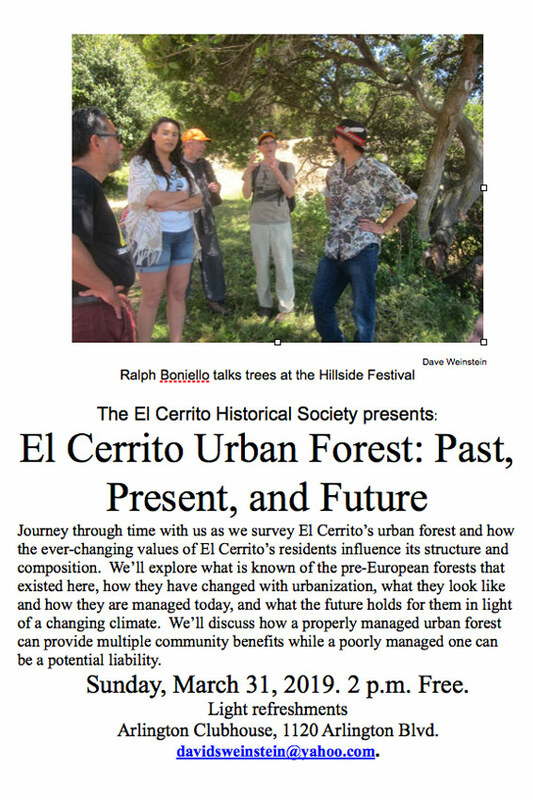 Four programs dealing with El Cerrito history – including its deeper history – takes place early this May as part of the festival. 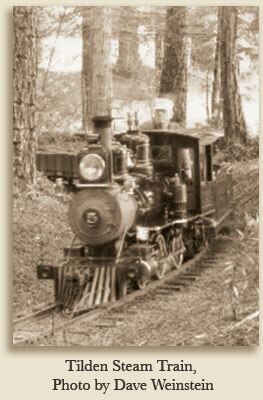 Friday, May 4, Noon to 2 p.m. Introduction to the Hillside Nature Area, its history and natural history. Dave Weinstein and Mark Miner. Co-sponsored by the Historical Society. Learn about the quarries, the quarry railroad, the Great Western Power Co., the history of the recycling center, and more. Meet at the Motorcycle Hill trailhead, where Navellier meets Blake Street. Saturday, May 5, 11 a.m. to 1 p.m. Hillside Natural Area Geology Walk. Co-sponsored by the Northern California Geological Society, leaders Mark Petrofsky and Bill Motzer. Learn about the geological setting of El Cerrito and about the rocks in our city – metamorphic rocks, the Franciscan formation, and faults and landslides. This moderate to strenuous walk will have steep sections. Location Six, Schmidt Lane trailhead. Saturday, May 5, 2 p.m. 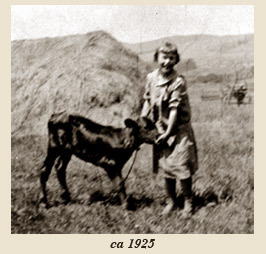 Early California Indian Life in the El Cerrito area. Berkeley’s well known historian and author and publisher of RSB books Richard Schwartz will discuss life in El Cerrito before the arrival of Spanish colonists, and about rancho life of the Californios. Meet at the “crossroads,” a spot with breathtaking views. From Location Four, the first, southernmost, trailhead on Regency Court, walk downhill a quarter mile. Signs will direct you. For information about the Hillside Fest and a full schedule, see the Trail Trekkers website. This overview of the culture and history of the Huchiun, an Ohlone-speaking tribe in the place now known as El Cerrito, will take you on a journey spanning thousands of years. It will end with a brief summary of the contemporary cultural involvements of today’s Ohlones. 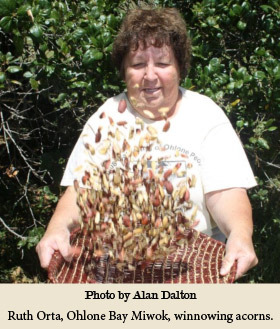 East Bay Regional Park District cultural services coordinator Beverly R. Ortiz, Ph.D., has published widely about her 30-plus years of field research with Native Californians. Thursday, March 15, 2018, 7 p.m.
For information, Dave Weinstein, 510-524-1737, davidsweinstein@yahoo.com. Wheelchair accessible. No need to RSVP! The Historical Society will kick off the city’s Centennial Year at its annual meeting Wednesday, January 25 at the Community Center. 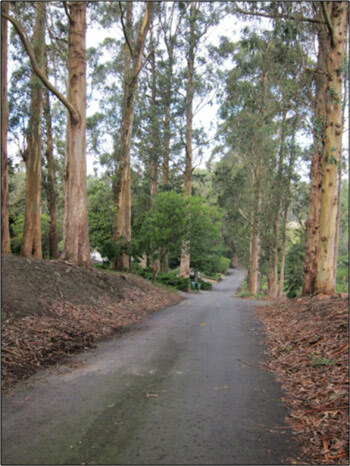 Learn about the geological setting of El Cerrito and about the rocks in our city – metamorphic rocks, the Franciscan formation, and faults and landslides. Gary Prost is a retired geologist who spent 40 years working for the U.S. Geological Survey, mining and oil companies, and is a member of the Northern California Geological Society. This will also be the Historical Society’s annual meeting. We will discuss our accomplishments and goals and elect officers. Interested in serving? Let us know! For more information, Dave Weinstein, 510-524-1737, davidsweinstein@yahoo.com. 2017 marks the 100th year since incorporation of El Cerrito as a city. What came before? What has happened since? For what is El Cerrito noteworthy? 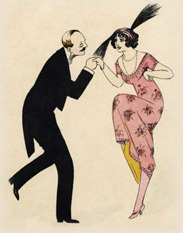 Who were the "movers & shakers" and what are some of the interesting stories to tell? 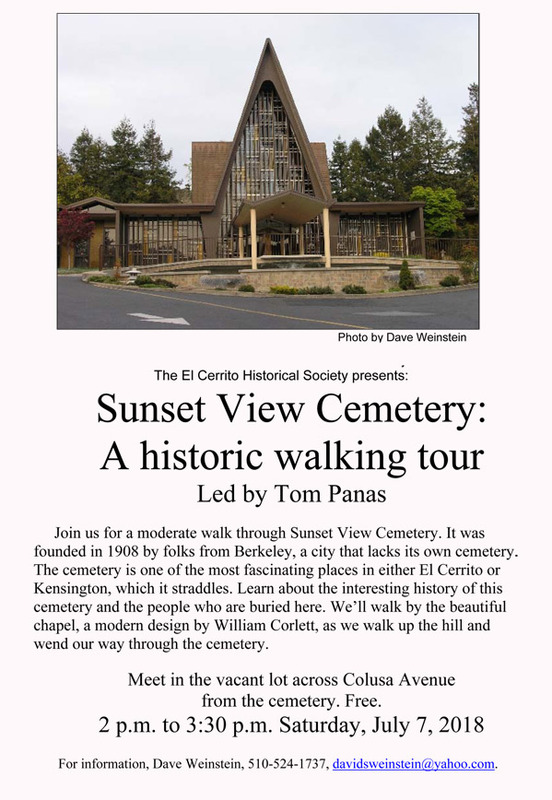 Click Here for the complete list of the El Cerrito Historical Society's 2017 Centennials Talks and Tours. Click Here for printable flyers for each of our Centennial Events. 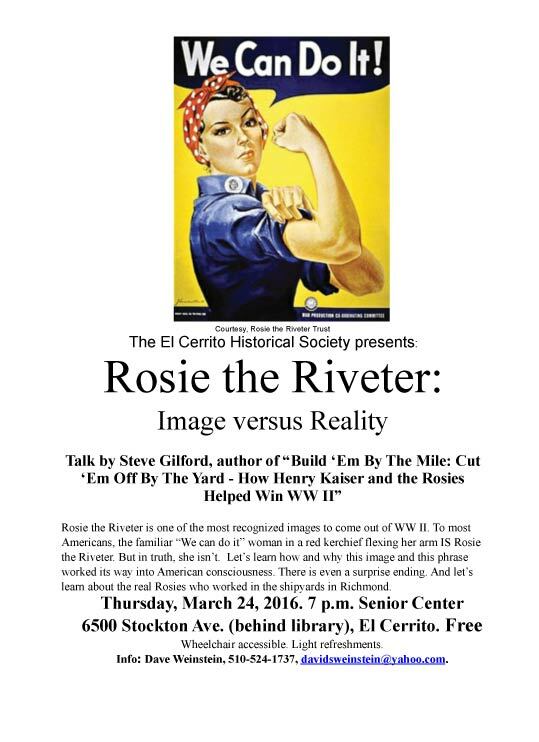 If your local organization would like a speaker on these or related topics, the El Cerrito Historical Society has a speakers panel available. Contact Rich Bartke 235-1315 richbartke@aol.com, or David Weinstein 524-1737 davidweinstein@yahoo.com.Click Here for more details. While focusing on the gambling and prostitution that once made the city a regional attraction, and on the changes that ensued as reformers and even a few lawmakers stepped in to close up the gambling joints, Dave’s talk will serve as a general introduction to the city’s history. We’ll hear about the first major industry in town to attract out-of-towners. Hint: it had something to do with death. 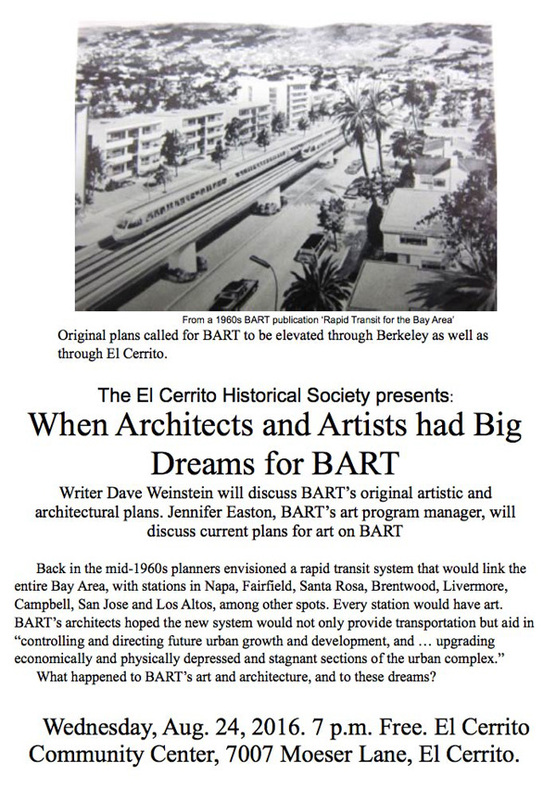 We’ll also learn about why one city just to our south looked to El Cerrito to provide some of the services people in that town wanted to have – only they didn’t want them to be in their town. 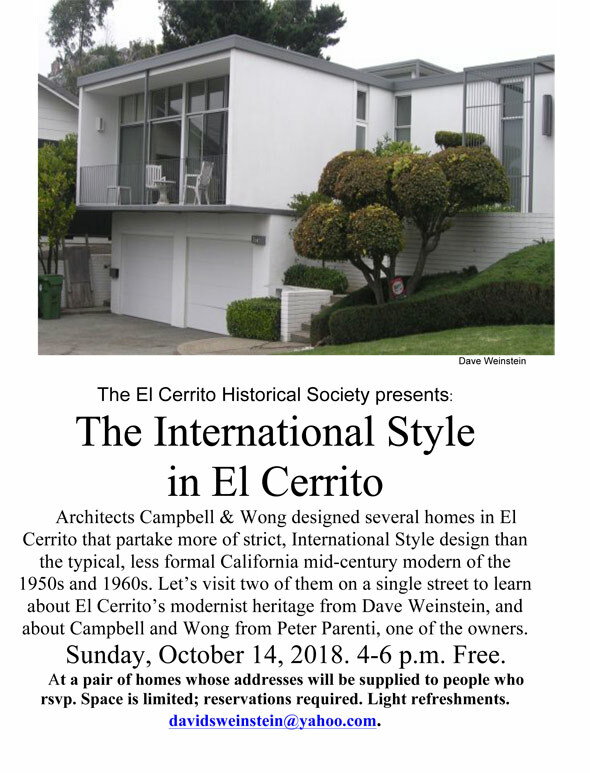 Author and San Francisco State lecturer Chris Sterba will describe how a group of reformers transformed El Cerrito from a "wide-open town" known as "Little Reno" into the bustling, middle-class Bay Area community we know today.Chris, who has lived in El Cerrito since 2001, received a Fulbright Award to teach in Norway in 2012-2013. He serves on the El Cerrito Arts and Culture Commission. Sunday, January 24, 2016. 2 p.m. Free. CommunityCenter, 7007 Moeser Lane, El Cerrito. This is the Society’s annual meeting We will also discuss annual accomplishmentsand elect officers. The talk will start about 2:30.Wheelchair accessible Lightrefreshments. Information: Dave Weinstein, 510-524-1737, davidsweinstein@yahoo.com. Sundar was once President of our Society. 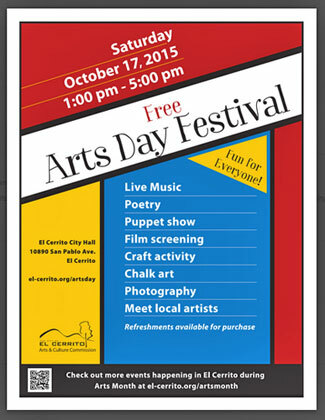 To celebrate National Arts & Humanities Month the El Cerrito Arts & Culture Commission is sponsoring a free Arts Day Festival on Saturday October 1 7th from 1 to 5 pm at El Cerrito City Hall. Activities and performances include a puppet show by Children’s Fairyland puppeteers, sidewalk chalk art, surf music by the Del Mars, film short by Les Blank, poetry reading by Kirk Lumpkin, street photography workshop, and classical chamber music performances by the KSO Trio and the JCT Trio. Painter Deb Danziger will give an artist’s talk about her solo exhibition in the City Hall Gallery, entitled Beyond & Below, and we’ll have a creative reuse “Make ‘n Take” booth. Local arts and cultural groups with exhibits include Playland Not-At-The-Beach, The Arts & Culture Commission of Contra Costa County, the El Cerrito Historical Society, and the Shadi Holiday Display Committee. Want to get involved with or volunteer to help out? Are you hosting an arts or cultural event, performance or exhibit in October in El Cerrito that you’d like to have included on the Arts Month web page? Other questions?Call Suzanne Iarla at 510-215-4318. For more information, including tentative times (which will be updated if revised), check out my blog post. 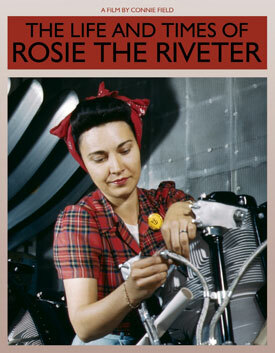 Join us for an exclusive Director’s screening of the award-winning documentary The Life and Times of Rosie the Riveter, including a Q&A with talented director, Connie Field! 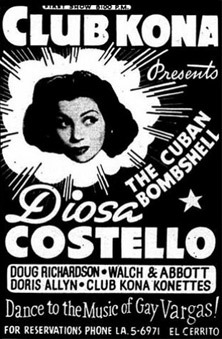 Thanks to the Berkeley FILM Foundation, the City of El Cerrito, Rialto Cinemas and the El Cerrito Historical Society, our co-sponsors for this event! Bay Area hills were originally open grassland with fringes of trees. In the East Bay, one man began planting trees in 1895 to forest 13,000 acres for homes in the hills and 3,000 acres for timber. What became of his dream, and how do we deal with his legacy today, amid development, drought, changing climate, and wildfire risks? Jerry Kent, former assistant general manager with the East Bay Regional Park District and a history lover, will describe the history of large-scale tree planting, and discuss the benefits and responsibilities of owning planted urban forests. Thursday, July 30, 2015. 7 p.m. City Hall, 10890 San Pablo Ave., El Cerrito. Free and open to all. Wheelchair accessible. The El Cerrito Trail Trekkers, in association with the city of El Cerrito’s Environmental Quality Committee and Park and Recreation Commission and with the El Cerrito High Mountain Biking Team, is holding the second annual Hillside Festival on Sunday May 17, 2015 from 10 a.m. to 5 pm. Activities for young and old throughout the 100-plus acre wild land area will include: nature hikes, a pop-up bike park, an identifying wildlife contest for kids, wildflower hikes, historical tours, talks on Native Americans and early settlers, a drop-in Broom Bash to remove invasive plants, hands-on habitat restoration education, free native garden plants, and more. Participants include Friends of Five Creeks, the National Park Service, the California Native Plant Society, El Cerrito Historical Society, the Community Garden Network, and more. 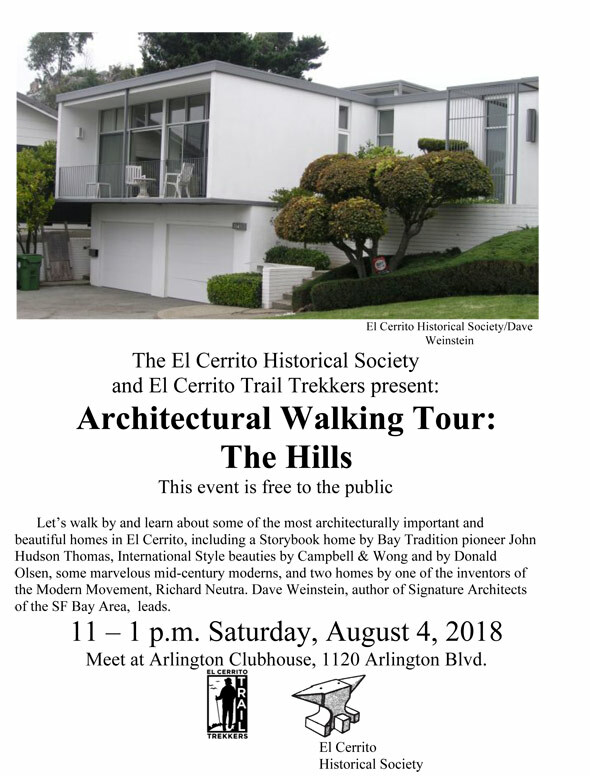 Historical Society programs include a talk and walk about the history of El Cerrito Parks at 10:30 a.m. by Rich Bartke and a 2:30 walk and talk on early El Cerrito settlers by Tom Panas. Tom will run a historical table from 10 a.m. to 3 p.m. near the King Court entrance to the Hillside. The event celebrates the city’s recent acquisition of the Madera Open Space with a noon ceremony. Working with Trust for Public Land, and a community campaign that raised $100,000, the city added the 8-acre site to the existing open land, tying together two previously disconnected sections. Though the event is free, donations will be sought to help pay for habitat and trail improvements. 10 a.m. to 5 p.m. at the Hillside Natural Area. Reception Area is the Schmidt Lane trail head, near the El Cerrito Recycling Center, 7501 Schmidt. Activities throughout the park. For schedule and map: ectrailtrekkers.org/hillside-festival. Have you ever wondered who designed the beautiful clubhouse? 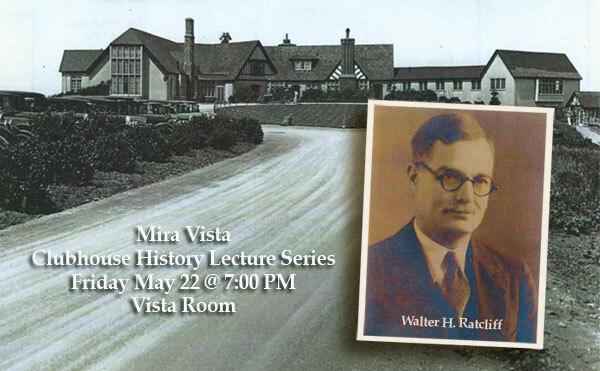 After Mira Vista’s “Pub Club” on Friday, May 22, Kit Ratcliff will be there to discuss his Grandfather Walter H. Ratcliff’s work and continued work of the firm that spans three generations. Space is limited! If you would like to reserve a place please contact Tom Panas. Time: 1 P.M - 4 P.M.
Wednesday, March 11, 2015 5:30 p.m. This event is free but attendance is limited. RSVPs required! Steve Chamberlin and Doug Giffin of Education Matters,the owner of the campus, will discuss the historically sensitiverestoration of the building and lead a tour. Founded in 1923 and operating in El Cerrito from 1935 to 1954, the Chung Mei Home was the only such home for Chinese boys in the country. The building has been beautifully preserved over the years and has been deemed eligible for the National Register of Historic Places. Education Matters leases the campus to Summit Public Schools, which opened last August. We are inviting some of the ‘Chung Mei boys’ who lived at the home. Meet in the Main Building of the historic Home on Elm Street. Three blocks from the El Cerrito Del Norte BART station. RSVP before March 9 – much earlier if you are wise! No one admitted without a reservation. Parking is very limited at the site so please try to carpool. For Information: Dave Weinstein, 510-524-1737, davidsweinstein@yahoo.com. 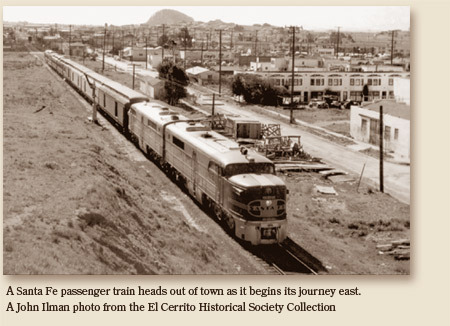 The right of way where BART runs through El Cerrito was at one time a busy Santa Fe route with many passenger and freight trains scheduled each day. Earlier this right of way had been the California and Nevada Railroad, whose trains first passed through El Cerrito in 1885. It all ended in 1980. Tom Panas will review almost 100 years of freight and passenger railroading in El Cerrito. During the business portion of our annual meeting, learn about the Society’s accomplishments and goals, enjoy refreshments, and help elect officers. Free and open to all. Wheelchair accessible. Information: Dave Weinstein, 510-524-1737, davidsweinstein@yahoo.com. Michelle Blackwell from the East Bay Municipal Utility District traces the history of water resources in the East Bay from the private water producers of the late 19th century to EBMUD’s founding in 1923 and developments throughout the 20th century. Location: Free. Arlington Clubhouse, 1120 Arlington Blvd., El Cerrito. Wheelchair accessible. Light refreshments. Information: Dave Weinstein, 510-524-1737, davidsweinstein@yahoo.com. 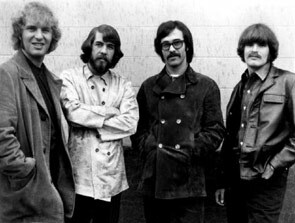 El Cerrito High School's Musical Legacy Kieth Johnson... director of bands at El Cerrito High and author of a new book and audio compilation on the history of music at the school, will discuss the school's illustrious musical history and play us a few tunes. We may even have some musical alumni join us. In the late 1920s thousands of acres of pristine watershed land suddenly became available for development. But civic leaders wanted to preserve the land as wilderness and for public enjoyment. In 1934, during the depths of the Depression, the public voted to create the first regional park agency in the nation. By 1936, the new district had purchased enough land to create its first three regional parks—and federal New Deal programs supplied much of the labor and capital to build them. Wednesday, August 27, 2014. 7 p.m. Free. 7007 Moeser Lane, El Cerrito. In June 1776, an expedition of 30 families arrived in Ohlone homeland to establish San Francisco. These 240 children, women, and men had come overland 1,800 miles from present-day Mexico. Our nation commemorates their journey as the Juan Bautista de Anza National Historic Trail. The Anza Trail connects history, culture, and outdoor recreation throughout Arizona and California -- including the East Bay and El Cerrito. 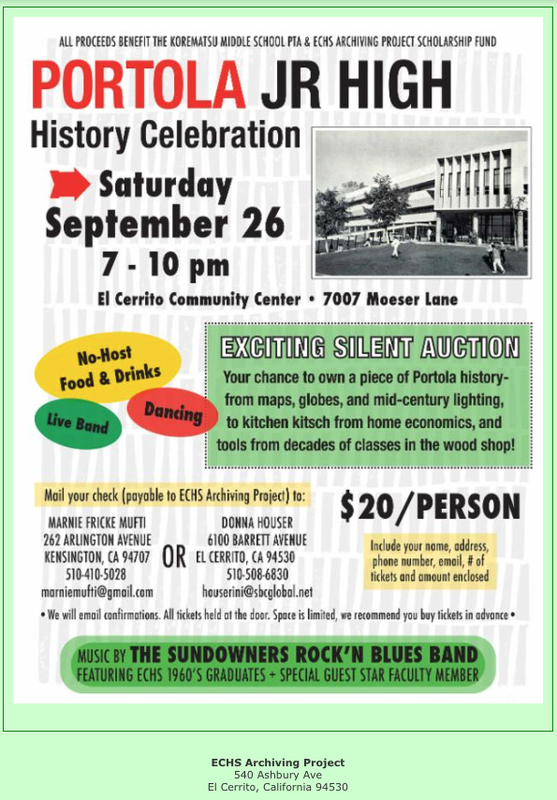 Come join us as we celebrate our Pioneers: those who were born in, or very near, El Cerrito before 1925. 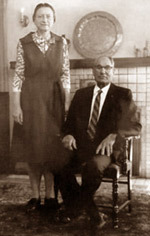 They grew up here and their families were part of the early days in El Cerrito. The El Cerrito Historical Society will be hosting a special reception at City Hall on Wednesday, April 23rd to honor these Pioneers. The reception will run from 4:30 PM to 6:00 PM. At around 5:00 PM we plan to introduce all of the Pioneers who were able to attend. Family members and others will have the opportunity to make brief comments at that time. If you know of someone who qualifies as part this group please contact Tom Panas by phone at (510) 526-7507 or via email at tmpanas@yahoo.com. Tuesday, March 25, 2014. 7 p.m. Free. 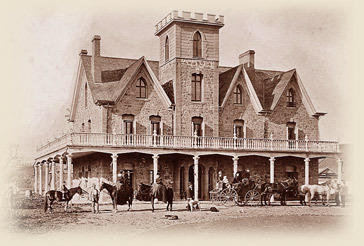 Arlington Park Clubhouse, 1120 Arlington Boulevard, El Cerrito. John Marsh, one of the most cantankerous figures in Northern California history, an Indian trader and self professed doctor who fought with the Sioux in the Black Hawk War, settled in Eastern Contra Costa in 1838, prospered – but met an unhappy end. Hear his story and learn about the Marsh House, a stone mansion from 1855 that remains one of the Bay Area’s most astounding buildings, though much in need of repair. Read more about the John Marsh House in our winter publication of The Forge. Our annual meeting will be 2 p.m. Saturday January 25 at the Veterans Memorial Building*, 6401 Stockton Ave. We will tour this historic building from the early 1930s, hear about its history from longtime members of the American Legion and meet the volunteers who work hard to maintain and improve the Veterans Building. *Please note that the Veterans Memorial Building is not handicapped accessible. At the Annual Meeting we receive reports from our officers about the Society’s activities and accomplishments this past year. We also accept nominations and elect officers and directors of the corporation for the ensuing year. Also we set the dues for the year. Please be thinking of who you would like to see on the board. Although the current directors have done a great job, there is always room for fresh voices. There are six current incumbents and a total of seven seats if the membership wishes to elect that many.